Do you imagine owning a dome-house and live anywhere? These mobile homes with a bubble form have a price that starts at 19,900 Euros can be installed in most inhospitable places. These modules have an area of 24.9m2 and there are four types: elevated above ground level, away from snow, on water and surrounded by vegetation. Imagine owning a sustainable house, energy efficient, with 360º views of the landscape and the sky in the place you choose and for just under 20,000 Euros? This is what is proposed by the Slovenian company Smartdome. 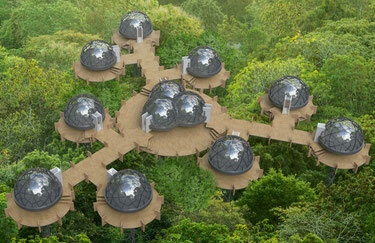 A construction designed for nature lovers with a dome shape and which straddles between a tent and a house. Under the premise of do it yourself, these domes are thought of as simple modules to build and transport to the place that any owners may wish. With this proposal, the company seeks to respond to those who, for example, are tired of the bustle of cities and want to move to a quiet place and just pay a reasonable price. In the words of the company, which aims to create a new lifestyle with which they intend to eradicate, or at least reduce, the tensions of today's society, according to them "every day more and more people live in an urban environment where they are exposed to constant stress and the best way to overcome stress is to live in the middle of nature”. While to rent may be economically unsatisfactory, and the construction or purchase of a normal home implies to live in a certain place for too long a period of time may not fit today's understanding of a more mobile world. Put a bubble in your life. Four types of Smartdome are available at the company's page: The Skydome, which would be elevated above ground level; the Snowdome, which is designed for cold and snow environments, ideal for places to practice winter sports; the Aquadome, which would be idyllic for places with water on which it would rise, like streams; and the Treedome, which would integrate vegetation into its structure and would be like a kind of garden house. Whether you are a nature lover or you dream of having a cabin in a tree, with these bubble houses a person can settle wherever they want without having to get involved in traditional housing access models. To create these mobile homes, the materials used are wood, metal and polycarbonate. Their characteristics may vary depending on the place where the bubble will be used, the future resident preferences will choose the model depending the selected site. Along the same lines, the first printed dodecahedron structure in the world, as reported by Smartdome, has an area of 24.9 m2 per module and about six meters in diameter. The modules are made of galvanized steel and a structure of laminated and moisture resistant wood sealed with rubber gaskets resistant to ultraviolet radiation. Buyers can choose between transparent modules with thermo-formed polycarbonate of two or three layers or opaque versions filled with mineral wool or sheet of space technology. The structure is supported by support legs made of galvanized steel that can be adjusted to heights between 1.2 and 2.2 meters above the ground, allowing the dome to be raised on steep terrain. The company points out, that the efficiency comes guarantee by the materials used and the good heat gained of the dome that generates a reduction of the energetic consumption. In addition, the base of the bubble is divided into two floors. Since the firm recommends that the upper level can be used to plant plants and the second can be used to collect water from the rain. But everything that glitters is not gold, like any habitat, domes also have their weak points. For healthy and comfortable living conditions, 70% of the air must be changed every hour, which means that a windows must be opened for the flow of fresh air for some time every hour, On the other hand, a long ventilation is a waste of energy, so they recommend the installation of an energy exchanger device, warn the developers. And from one to various bubbles to form a community. 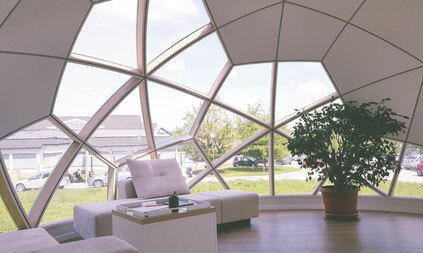 The company can manufacture larger and smaller domes, with the lowest price being that of 19,900 Euros. Finally, it should be noted in order to install various of these houses, the impact the can generate on nature should be taken into account, so that if their proliferation increases in the future, it may be necessary to regulate their.